After lunch, TNT openers Jake Dennien and Lachie Gunner batted patiently, scoring the runs without taking risks. They continued for 20 overs until the score reached 50, when Jake (26) was given out LBW. Lachie continued batting to be out for 38. Many of the other batsmen started well but no one was able to go on and post a big score which was the only down side of the day. Half-centuries plus will be needed against the stronger teams later in the season. Just before stumps, TNT were all out for 219, a lead of 150 runs. Other above 20 scores were Jarrod Officer 36, Troy Dennien 27, Cody Rzeszkowski 27, and Tom Freshwater 26. Next Saturday the TNT bowlers will be putting the pressure on from the first ball, to bowl out the Pioneers for less than 150 and claim maximum points for the second time this season. SECONDS were home against Burpengary in a must win game to get their season started. They sent the opposition into bat and their innings built slowly. The TNT boys hung in and fought hard all day, bowling well in partnerships to create pressure and taking the chances given. Burpengary were eventually all out for 151. Pick of the bowlers were Tom Stewart 3-56, Adam Curry 3-18, Will Gear 2-7 and Robbie Payton 1-26. With 14 overs left to bat in the day it was a good chance for TNT to put a few runs on the board. TNT finished the day at 2 down for 43 with Reid Campbell outstanding with 32. But all in all, a much improved performance and the game is set up for a TNT win next Saturday. THIRDS. The team played against Cooroy-Eumundi Club at Cooroy and were asked to field first. It turned out to be a similar tale to the previous week with a flat deck and some patient opposition batting making it a long hard slog. Troy "Gallop" Evans bowled great lines early and was rewarded with the opening wicket. All the bowlers worked hard and TNT were on top at 4-64 shortly after drinks. The next pair dug in until lunch until Troy again made the breakthrough and finished with 2-22. Blake O'Donnell 2-32 picked up a couple of lucky wickets whilst Wayne Moore 2-29 and Jason Toohey 1-37 kept the wickets falling. Then Todd Macnamee, 2-19 off 15 cleaned up the tail for 181 which was probably about 20 more than they should have scored. However, 140 overs in the field on the last two Saturdays, with an average run rate just above 2, tests even the best. The TNT openers faced 3 tricky overs before stumps which were negotiated for 7 without loss and set the team up for a good chase next week. 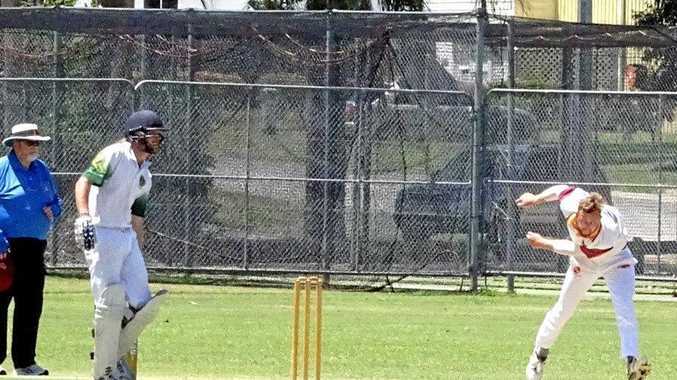 FOURTHS: The team was sent into bat by Palmwoods at Dale Officer Oval on a pitch that should have produced runs however the team lost wickets regularly and was dismissed for a disappointing score of 103. Young teenager Jack Saunders came to the crease in his first game in seniors and made a patient 16 in a partnership of 30 with Justin Talbot (17). Of the others, only Brenden Chaplin troubled the scorers with a well-made 26, including two sixes in the one over. TNT bowlers showed their skills later and, at stumps, Palmwoods was 5-76. Luke Anstey took 1-20 off 11 and was unlucky not to have a couple more. Others to get wickets were Brenden Chaplin 3-11 off 7 and Graham Chaplin 1-10 off 5.